Let’s talk about Managed IT Services and how much money your company should be spending on the specific services your IT department needs. Sounds pretty interesting, huh? We aren’t in denial about this, and we know IT probably isn’t the most exciting thing you want to learn or talk about. However, when it comes to your business, managed IT services has a lot to do with business growth and the future of your company. With that being said, as you research different managed IT service providers online, are you struggling to understand how much you should be paying for the services and features you need? Are you even sure of the specific types of IT services your business needs to function at its best? Before you can begin to evaluate the pricing models of managed IT services, you must first become familiar with the IT services and features your company needs. Every company is different and depending on the type of work your business does has a lot to do with the individualized services you might want or need. As your business grows, IT is a complete oversight until something breaks, or you have a breach or a malware problem. Then, you have to decide who is going to manage your network, applications, devices, train staff, and protect your business from outside threats. What Types Of Managed IT Services Does Your Business Need? Before looking at different pricing models, let’s take a look at some of the different managed IT services and features your business may need. Virus Protection: One of the main threats to technology for a business is a virus. They come in through email or can even be downloaded (by accident) from the Internet in the form of ransomware or malware. Without a robust anti-virus strategy with continuous updates, you could cripple your business or can be extremely costly. It seems like every day we hear of another business that is being extorted to get their data returned to them. Labor: As your business grows, you’ll need to start investing in IT personnel. Adding new members to your team can be expensive when accounting for their pay, benefits, tools, and space in your business. And what happens if when they leave or get taken from you by a recruiter or one of your own customers? There’s no loyalty these days. Email: This may appear to be something simple, but there’s a lot of administration (adding and removing users), configuration (company signatures), and training (applications or devices) when managing emails for business. All this time adds up. Network Monitoring: Connectivity, whether it’s wired between each of your staff members, wireless, or even mobile connections, are required for any business to function properly. A business needs to make sure there’s some level of oversight to ensure that your staff is protected and secure in their day-to-day communications from internal issues and external threats. Vendor Management: Vendor management ensures you’re getting maximum value from your technology providers. A managed IT service company can help you manage all of your contracts with the technology companies you use and scrutinize them for responsiveness and time to service, value, quality, and ensure that all deliverables are being met. vCIO (virtual CIO): You probably can’t afford a full time, real, CIO for your business, but how about a virtual CIO? Wouldn’t it be great to have a go-to person that can create a technology roadmap that grows with your business and leverages technology to help you meet your business objectives? If you want to learn more about how a vCIO can help your business, read our article, What's a Virtual CIO (vCIO) — How Can it Benefit Your Business? Data and Storage Backups: When storing your important files for your business, there needs to be someone to manage all your data and make sure you have a plan to back it all up on a regular basis as well as the ability to restore it if the need arises. Ever hear the terms, business continuity or disaster recovery? If you collect data, which 99% of all businesses do today, you should make these part of your technology plan. Compliance: Many businesses may work in a regulated environment or follow best practices with internal processes or even comply with basic human resources needs. This could be as simple as protecting your staff or customer’s personal information, or as much as meeting HIPAA compliance if you’re a medical office or hospital. Your technology may need to meet these regulations or requirements, and you’ll need someone to ensure your organization can meet these needs or have the understanding to meet them in the future. Security: With any technology in a business, there is always a need for some level of security. Security can be as simple as user security levels or access to documents, offices, or your building inside your organization. Alternatively, it may be to protect you from outside intruders using a firewall. In any case, you will need someone that can plan, administer, and continually secure your property, assets, and data. To read the full list of the types of managed IT services your business needs, read our article, here. Now that you’ve figured out the types managed IT services your business might need; we can dive into the cost of these services. Which Managed IT Service Pricing Model is Best? Managed IT services have a variety of pricing models, so it’s important to make sure when you’re requesting proposals, you understand each model. Once you become familiar with the different models, it’ll be easier to compare the costs of each one. 1. Flat Based Fee: The Flat Based Fee pricing model is the most popular pricing model because you pay one flat price for your particular services and features. This model is usually the most flexible plan and often includes 24/7 support or published hours in the initial pricing proposal. Additional proposals that include extra services can come with a bundled monthly price. The service provider may even provide extra items offered a la carte, or one customized proposal all bundled together. Getting one, flat based fee, whether monthly, quarterly or annually, makes it easy to understand and compare pricing to the other models or compare it to the costs of hiring additional personnel. There’s no set price range for this model since each provider provides a proposal to support your individualized business needs and features you want. If your business is growing and you want to ensure stability in your services and the pricing that comes along with it, this model would greatly benefit your company. 2. Per-User: The Per-User pricing model is exactly as it sounds. The managed IT service provider provides you a price for each of your current users and details what services they will be providing your entire organization and each employee. This model makes it easy for budgeting purposes and future costs as your business grows, you can easily approximate the added cost for each added full-time employee. Typical pricing of the Per-User model ranges from $125–$200 per month, per user. If you have a smaller company with only a few employees, the Per-User pricing model could be an excellent option for your business. 3. Per-Device: The Per-Device pricing model is similar to the “Per-User” pricing model, except that it’s based on each device or each piece of equipment that you and your business use. Some of this equipment can include, desktops, laptops, mobile phones, tablets, printers, home PCs, copiers, desktop printers, etc. This particular pricing may begin at a lower rate than the “Per-User” pricing model but could potentially quickly escalate due to the number of devices that you may have throughout your organization. Typical pricing for the Per-Device pricing model ranges from $5–$100 per month, per device. If you don’t have too many devices and don’t plan to add more, this model might work the best for your business. Tech Target published an article on the popular types of managed services pricing models that might help you understand the costs associated with IT features a little better, What are the popular pricing models for managed services providers? It takes a little while to become familiar with the managed IT services and features your business needs as well as how much you’ll have to pay for them. Don’t hesitate to reach out to the service providers you’re interested in if you feel you have questions you just can’t seem to answer on your own. 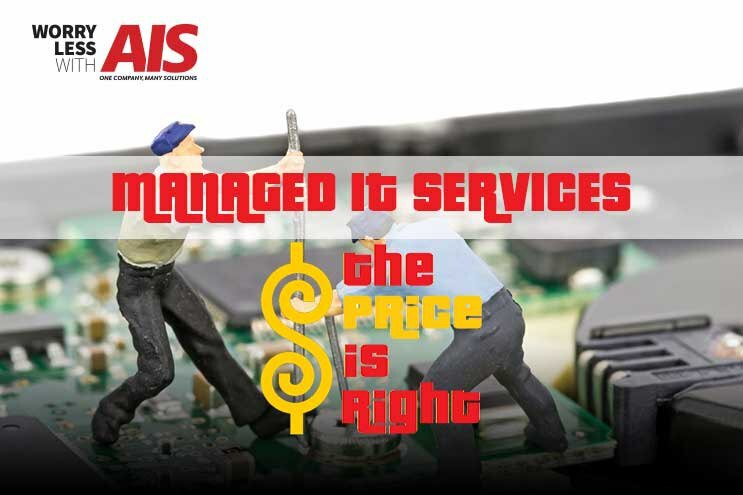 At AIS, we strive to educate and inform you on the best ways your business can get the most out of a managed IT service provider. It’s important to us that you are making the best overall buying decisions when it comes to managed IT support. If you want to learn more about managed IT services, or still have questions, we’re here to answer them! Reach out to one of our business technology consultants, here. We’re here to give you peace of mind that helps you win more business.